Putting together a dream superhero lineup is a common pastime for fans, and in the pages of Justice League: No Justice, the supervillain Brainiac is getting in on the fun, showing Earth’s heroes that they could be working in more imaginative, efficient configurations. Written by Scot Snyder, James Tynion IV, and Joshua Williamson with art by Francis Manapul, Marcus To, and colorist Hi-Fi, No Justice is a weekly miniseries building on the events of the exceptional Dark Nights: Metal to set up a new era of Justice League titles. And the writers are channeling Metal’s no-holds-barred for a thrilling superhero spectacular. “On a surface level, each team is color coded and their palette lands on the opposite end of the color wheel as their respective villains,” says Manapul. “On a deeper level Scott, James, and Joshua also wrote each team in a very different environments, which helped me create an atmosphere that matched the tone of each team.” Manapul is joined by Marcus To for the rest of No Justice, and the stylistic overlap plus Hi-Fi’s coloring makes for a smooth transition between artists. 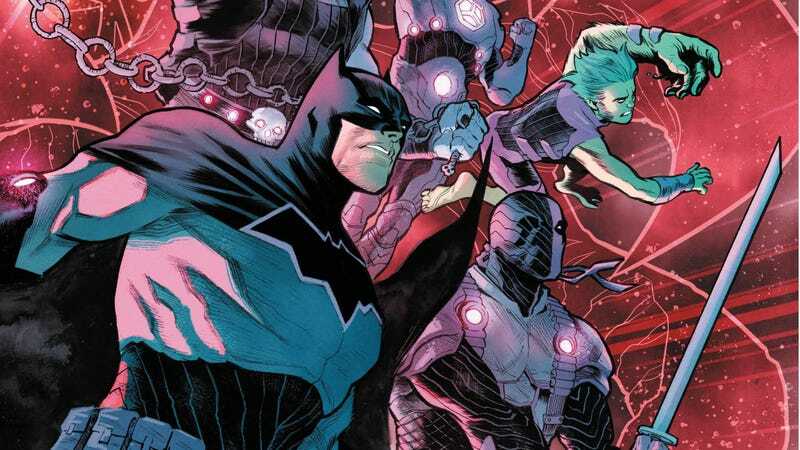 The visuals on No Justice match the grandeur of the script, and DC is putting a lot of muscle behind this summer’s Justice League revival.